This year, I started writing monthly goals on the blog as a way to motivate myself to get things done and stay accountable. 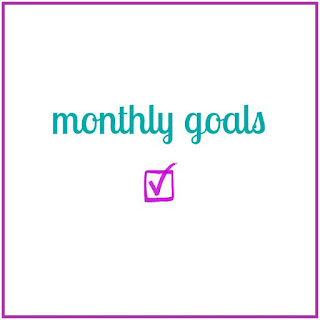 Here's this month's recap and next month's set of goals for my home, my blog, and my family or personal life. Although I recently changed my post schedule to 3 days a week I plan to continue to share my goals on the first of every month. 1. Sell our house. Not yet. Hopefully soon. 2. Buy a new house. Also not yet, although I think we may have found "the one." Too soon to know for sure. 1. Make a list of blogs I'd like to contribute or guest post on and contact them. I still haven't done this, although there are a couple of brands I'll be collaborating with next month. 2. Keep working with PS Elements and get more comfortable using it. Another fail... While I've watched a few tutorial videos on creating product collages, I haven't really done any experimenting myself. I just haven't had a lot of time lately. 1. Fill photo album with July pictures and print photos for August. Done. This one took me until just about the end of the month, but I did get my July pictures in my album. 2. Visit Murray's in KC. No, I didn't make it to Murray's but I went to my other favorite, Sylas and Maddy's. It really is a toss-up between the two, I love both places so much. 2. Buy a new house. PLEASE let this be the month. 1. Clean up my Pinterest boards. I love Pinterest and I use it religiously, but one thing I've never been good about is cleaning up and paring down my boards. It's important to me that my pins come from an original source when possible, and I'd like to remove any old pins with broken links or unknown sources. 2. Keep working with PS Elements and get more comfortable using it. Hopefully this month I'll find some time to work on this one. 1. Fill photo album with August pictures and print photos for September. 2. Go on a date. It's been since our anniversary (July 1st) that Aaron and I have had a date night, so I think we're due for another. 5 years ago: making pork chops with peaches and wearing red, white, and blue.